greenery, and deep blue designs. Check out our Instagram post about it! The temperatures are dropping, the leaves are falling, and our homes are changing once again! We love Autumn/Fall and everything about the weather, hot chocolate, and interior design plans. There's something refreshing about putting away the skeletons and cobwebs and bringing out the leaves, signs, and warmer colors. Here are some fun Fall favorites that work from October to November (before those Christmas decorations hit! )—hope you love them as much as we do! Warm up your space with a giant, soft throw blanket. 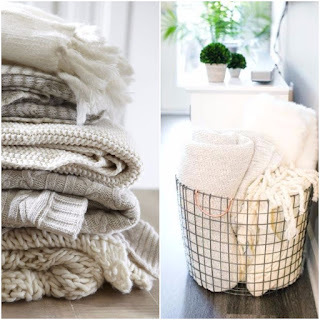 We love the knit throw blankets that fill up a couch and feel like a cloud. What would Fall be without pumpkins everywhere? 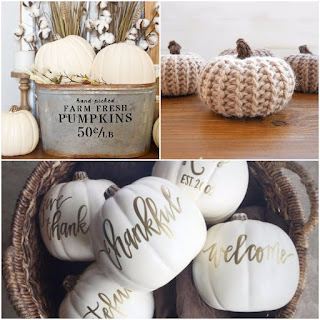 Find a style that works for you—we choose white, painted pumpkins or fabric pumpkins! Avoid decorating with a carved pumpkin, because those could rot in one week. Bring nature indoors and grab a few tree wood slices at your local craft store. We love using these slices as chargers on a table. You may also think about chalk painting them to add a personalized message for a special occasion such as a birthday or anniversary. They're beautiful, easy to use, and interchangeable for other holidays or events. great dimension and texture to your holiday table. beautiful sign for this little vignette. Pick up some pomegranates, apples, pine cones, leaves, and whatever else you find on your way home! 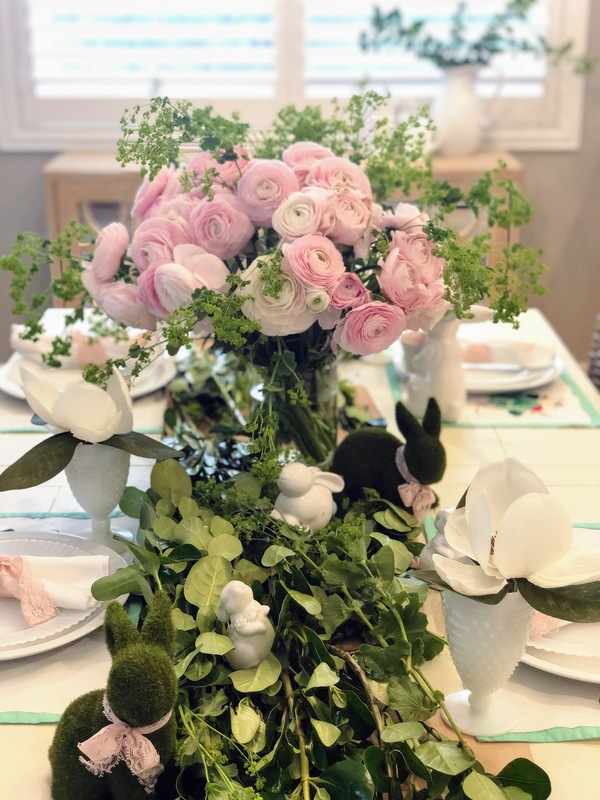 This is a category where you have to use a little more creativity, but once you find a way to display garlands/fruit inside, you'll never go back. Sue found some acorn tops when she was in Utah, and brought them back to style! Even a few leaves from your trees outside will be a great start. We're sneaking in a little bit of Christmas with this one! 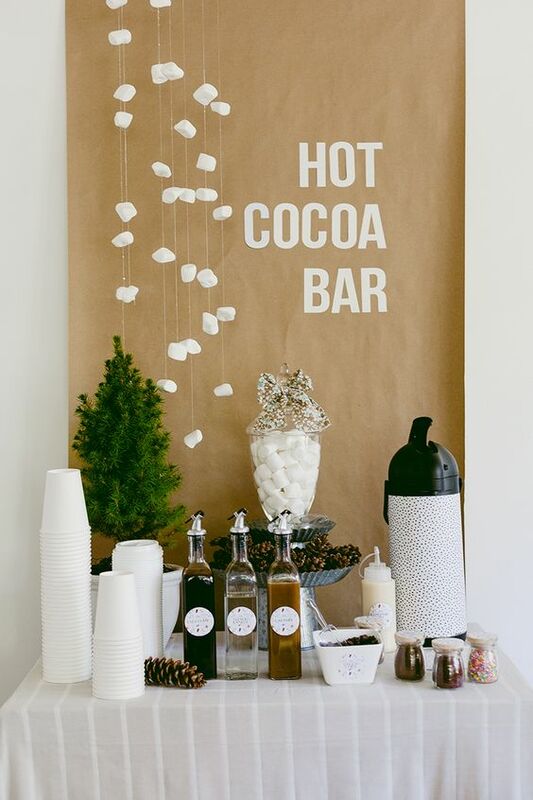 A hot chocolate bar cart or counter top station should always be stocked and ready to go. This will soon become everyone's favorite spot in your home. You can buy those adorable hot chocolate cups with the lids and use cinnamon, peppermint, marshmallows, and more. Display your mugs, hang a custom sign, and don't feel guilty for drinking two cups a day. 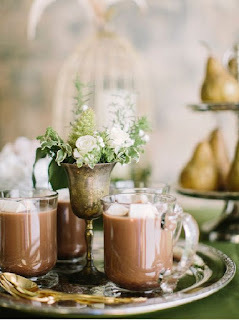 These photos (from this gorgeous wedding and The Ruffled Blog) are giving us some serious ideas about decorating with more chocolate! paper, pumpkins, candles, and more. These are just some of our favorites for this Fall! There are endless things you can do to decorate your home to make it your own. Find what work best for you and nothing is off limits. Good luck! Leave us a comment if you have time, we would love to hear from you!